Weather was absolutely fabulous for the entire week having average to just above average temperatures and reasonable to lite winds. 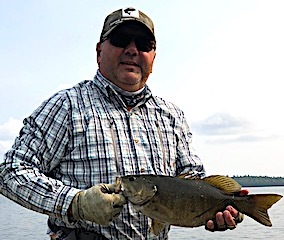 The fishing reflected the nice weather as I have found over 29 years guests are always more successful with more manageable weather conditions. Jeff Wilson from the Burlington, ON here for his 3rd time arrived with his father Bill for his 2nd visit with us at Fireside Lodge, and joining them in just a few days will be Jeff’s brother Craig from Hubbard, Nova Scotia returning for his 2nd time this year and his 4th trip, along with his friend Tracey MacKenzie, both from Halifax, Nova Scotia, for his 1st experience fishing Little Vermilion Lake System. Jeff fishing just a few hours after arrival caught a 17.5 and an 18.5 Trophy Smallmouth and a nice Pike fishing with his favorite lure from last year, a Zara Spook. 1st day they had a good day Smallmouth Bass fishing, caught some Northern Pike and had the opportunity with three larger fish. 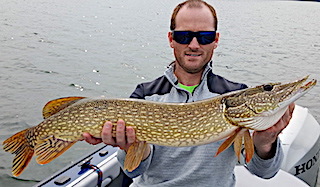 2nd day Jeff had some exciting action surface fishing for Northern Pike but the fish kept missing his lure. 3rd day Jeff and his dad had a great day catching many nice Smallmouth Bass and Northern Pike and this is the day Craig and Tracey arrived. 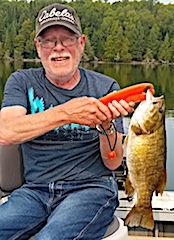 Well on the day of Arrival on Tracey’s very first cast he caught an 18.5-inch Trophy Smallmouth Bass Fly Fishing with a small popper. What a great way to start. 4th day they all did very well catching big Smallmouth Bass and Northern Pike, and Tracey while Fly Fishing had a BIG Northern Pike right up to the boat and it came off just before Craig could get the net under the fish. 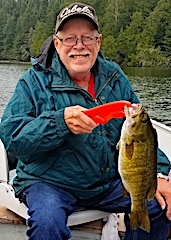 5th day was super good for all catching a lot BIG Smallmouth Bass in the 17 to 18-inch range, Bill landing a huge Master Anglers Award 18-inch Smallmouth Bass plus they all caught Northern Pike. Tracey did great again Fly Fishing landing his first Northern Pike on a new fly that has great action. 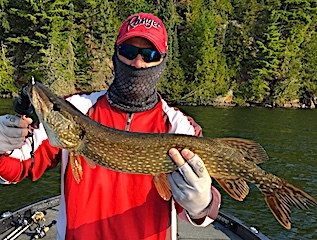 6th day Jeff purchased a few lures from our tackle shop and it turned out well catching a lot of big Pike with it and had a minimum 40-inch Trophy up to the boat with the same lure. Also, on the same lure Jeff said he had the biggest Smallmouth Bass hooked he had ever seen in his life, but missed landing it as it threw his hook very near the boat. 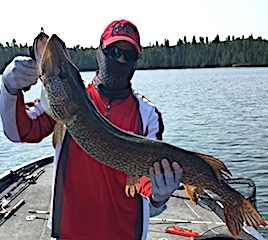 7th and final day for Jeff and his Dad they had a fantastic day again using the same lure with Bill catching a half dozen Pike and Jeff catching 11 BIG Northern Pike including a 40-inch Master Angler Award Trophy and soon after that hooked and landed a HUGE 42-inch Muskie. WOW, what a fabulous fishing feat and what a way to end a memorable traditional fishing trip with Jeff and his father. Craig & Tracey still have two more days. 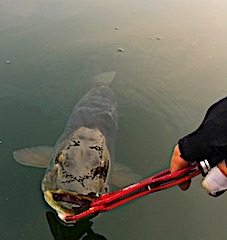 Well they did very well on the next day catching many Northern Pike to the point that Tracey said the fish wore out a lure that he purchased from me that very morning. Final day for these two found them on a portage to one of our out lakes. Well the fishing was so good they could hardly get themselves to leave. 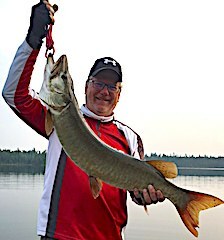 They had a tremendous amount of Big Muskie follows plus had several hooked & lost and Jeff had the catch of the day landing a beauty 40-inch+ Muskie. 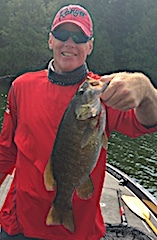 They also cashed in BIG Smallmouth Bass both catching numerous fish and Craig managed to catch a Monster Trophy 19-inch Smallmouth. Both had a fabulous visit and upon departing Craig said “See Ya Next Year”. Long time return guests Gary & Josh Johnson from Midlothian, IL were back for there 2nd time this summer to chase BIG Toothy critters. 1st day was very good catching 17 Northern Pike up to 34-inches before supper. 2nd day was a bit slower for them but the third day was great hooking up on at least 35 + Northern Pike and landing 23 nice fish. They were very pleased but could not figure out why they lost so many fish, but as all fishers know we just have some days like that. 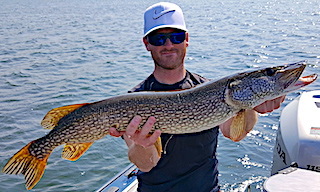 4th day was another good day catching a lot of Northern Pike up to 36-inches. 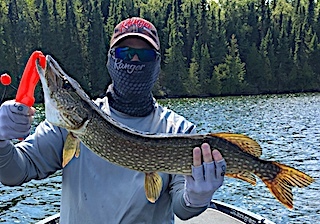 5th and final day they did very well again catching 17 Northern Pike with a lot being good sizable fish between in the low to upper 30-inch range. Both enjoyed their stay and are already looking forward to returning for their 3rd time in 2019 on September 2nd. Brothers Jim and John Dickerson from Westfield and Noblesville, IN with sons James from Hoboken, NJ and John II from Indianapolis, IN returned for their 4th time with Richard Whitney from Still River, MA for his 1st visit fishing at Fireside Lodge. DOA & 1st full day out all caught fish, a mix of Smallmouth Bass up to 17-inches and some nice Northern Pike. 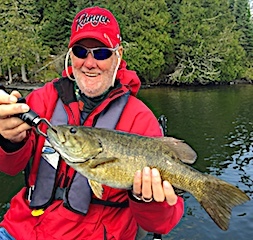 2nd day was very active with James at times being kept so busy netting Jim & John SR Smallmouth Bass that they kept him out of the water. 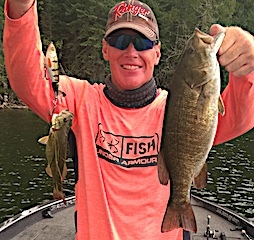 James said they were catching one after another both landing a 17.5 and 17.75-incher but James was rewarded catching his fair share plus catching the biggest in the boat, a Trophy measuring 18-inches. All the while John II and Rich were also doing very well John II coming up with the catch of the day landing a 20.5-inch Trophy Smallmouth Bass. This group had a special contest formulated by Jim nobody really understands yet as the rules will be revealed on the last day after all fish have been caught. 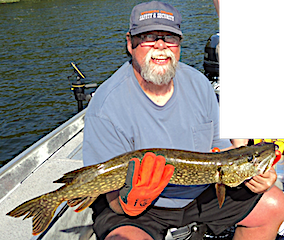 He gave me the rules in advance and the prize winners will be the largest percentage of the master anglers award size for Smallmouth Bass, 18-inches, & Northern Pike 40-inches & Muskie 44-inches & Walleye 24-inches which makes a potential of 4 prizes. 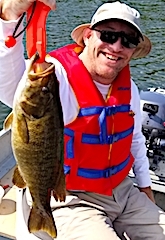 So with John II he would have a percentage on his 20.5-inch Smallmouth 20.5/18 = 1.13. This will be hard to beat in the Smallmouth Bass category. 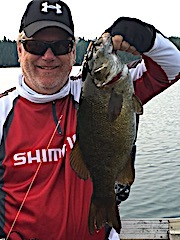 3rd day John II did it again catching another Trophy Smallmouth Bass right at 18-inches and James just missed, landing a few in the 17-inch range. 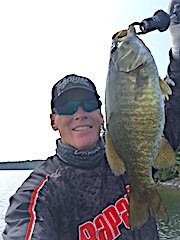 Day 4 was windy and challenging however John II did it for the third day in a row catching a Trophy Smallmouth Bass measuring 18 inches. 5th day they caught a mixed bag of fish enjoyed the heck out of their last evening. All departed making great family memories.